Necessarily Unashamed: So I did sit and eat. I have a theory "love" is the most abused word in the English language. "Love" is the same word we use to describe our feelings for favorite foods, good weather, our own children and spouses, the relatives we're obligated to care for, friends we've known for decades or still don't know well, and as a synonym for zero in tennis. We inscribe it on chalky candy hearts and expect it in pink, cursive letters with kiss marks this month. We read it in Hallmark cards and Shakespeare. This word is so overused, it scarcely has meaning, but it has a reputation for being the most meaningful thing on the planet. It's the subject of nearly every good song. We're told it's what we live for, it's all we need. We're told we should be willing to take risks for it, work hard to keep it, and perhaps even die for it. Some of us also use it to describe our feelings toward certain sports teams. I certainly include myself in this category. Especially tonight, after such an incredible game. It is a very real sensation, is it not? We invest ourselves emotionally in these games just as we invest ourselves in stories. There is a sense of narrative that is reinvented by sports reporters and features writers for every major game. 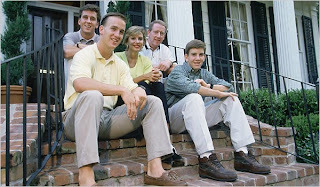 Eli Manning is rewritten from the scrawny little brother to a quiet, upstanding man who leads by example. This character is mostly invented by the press. But we also know very real things about him. A guy sitting beside me during the game laughed as Peyton Manning cheered his little brother on. "Doesn't he really want him to lose?" he joked. "Don't you think they quarrel over the dinner table? Tomorrow Eli will come to dinner and just set the trophy on the table and start something." I held my tongue, but I wanted to add that that is completely inconsistent with Eli's character. I knew because I had read an article on his relationship with his mother, which detailed his behavior at the dinner table with his brothers (he was always reserved and not especially competitive). It's disgusting, isn't it? What a twisted world of celebrity. But I certainly don't know as much as most sports fans. Of course there is a real sort of love to it, if only a surreal one. An empathetic love. More of an endorphin rush than a good chick flick or a romance novel, because of the emotional investment over a longer time (and how seriously we take a good football game). But I believe it's the same sort of desire for narrative that leads us to love a novel. We want to be invested. We want to project our emotion into this. We want to watch an underdog triumph over a solid, seemingly infallible force. We feel affirmed when someone defeats the odds, as though what's going on in some stadium in Arizona for a few hours can grant us some sort of hope for our own tedious lives. Anyway, the direction I wanted to take this was Milton's. God is love, is He not? In the context of the text, at the very least. But God is above all human emotion. He can't experience envy or pride, as much as he seems to when Satan's followers describe him. He has transcended this. And I don't believe my love for the New York Giants - as strong as it may seem - has actually transcended human emotion into God's realm (even if you don't believe in God, in Milton's God's realm). So what is it? And how do we quantify it? Above all, what draws us to story? Why are we hungry for it? 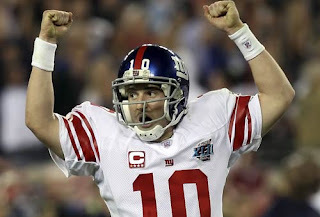 Why will Eli Manning's face sell thousands of papers tomorrow morning? Why do we read our children fairy tales? Why do we still buy books? Why are we on the internet at 1:15 in the morning? I know this is a common experience. The Super Bowl is a perfect example of shared investment in story and character. Even people who have not followed the Giants since birth were caught up in their victory. The question I have is: why?